Get your Utah permit in this all-inclusive one day class! Now includes the WA state I-1639 mandated training material required to purchase a semi-automatic rifle after July 1, 2019. 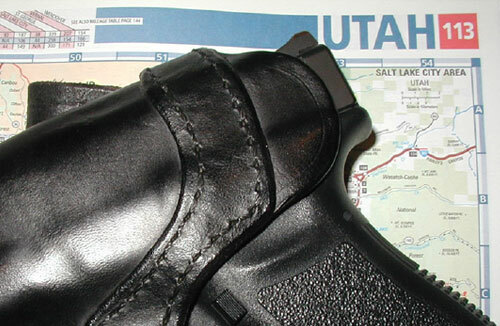 The Utah Concealed Firearm Permit expands your concealed carry horizons. By combining a Utah permit with your Washington State Concealed Pistol License, you will be able to carry in 33 states! This 4.5-hour all-inclusive class fulfills the Utah training requirement and gets your application ready to submit. As a bonus, you will receive a proof-of-training certificate you can use to apply for OR and AZ carry permits. Alabama, Alaska, Arizona, Arkansas, Delaware, Georgia, Idaho, Indiana, Iowa, Kansas, Kentucky, Louisiana, Maine, Michigan, Mississippi, Missouri, Montana, Nebraska, Nevada, North Carolina, North Dakota, Ohio, Oklahoma, South Dakota, Tennessee, Texas, Utah, Vermont, Virginia, Washington, West Virginia, Wisconsin, and Wyoming. The Utah permit application fee is in addition to the Utah class fee. If you are a WA resident, you must have a WA CPL to apply for the Utah permit. You can still take the class -- just hold on to your application materials until you have the WA CPL. Apply for your WA CPL at your city PD (in you live in incorporated area) or Sheriff's office (if you live in unincorporated area). This class can not give you a WA CPL. This class satisfies ONLY THE TRAINING REQUIREMENT for other permits such as OR and AZ. Those states have separate forms, fees, and processes which are not included in this class. The course includes fingerprinting for the Utah permit on the requisite UT fingerprint card. If you wish to substitute an AZ card for the UT card that is fine (you must supply the AZ card). If you want cards for both UT and AZ there will be an additional $5 fee per additional card (and you must supply the AZ card). We are unable to provide fingerprinting for OR cards as they must be done in person by OR law enforcement. All students must be US Citizens or Lawful Permanent Residents. 1639 students should be WA residents (out of state residents cannot purchase semi-auto rifles in WA even with training). Utah students must be 21 to apply for the permit. Any students under the age of 18 must attend the course with a parent or guardian. NONE, all equipment supplied by InSights. For your Utah application, you will also need a check or money order for $63.25 made out to �Utah Bureau of Criminal Identification�. Credit cards are also accepted.